It's been an overall cool, rainy and very windy weekend here. Of course this is Hawaii so in between the rain downpours there is sun and the temperature doesn't dip too low, but still it is comfort soup weather for sure. I enjoy soup all year long regardless of the weather, however a stormy day makes me want a simple soup that is thick and hearty and can bubble away on the stove all day ready to scoop into bowls for a warming dinner. This simple Navy Bean Soup meets criteria and so it got bumped up on the soup-to-make list. The recipe comes from The Feast Nearby: How I Lost My Job, Buried a Marriage, and Found My Way by Keeping Chickens, Foraging, Preserving, Bartering, and Eating Locally (All on Forty Dollars a Week, by Robin Mather. I picked up this book for a great price at the Borders close out sales and it has sat on the nightstand, the essays being dipped into each night before bed. Mather is a food journalist who lost her job and decided to end her marriage. Simplifying her life led her back her native rural Michigan where she moved into a 650-foot cottage on a lake. The book journeys through the seasons on her year-long quest to eat well seasonally, locally, on a budget and lead a simple life. It's good fun and the essays combine her experiences, tips for homesteading and of course recipes. Robin Mather says, "I make this recipe just for myself, freezing half or more in individual plastic containers that hold 2 cups, just enough for a fast lunch or simple supper. Some people, including me, like a little lemon juice or apple cider vinegar stirred into a bowl of bean soup to brighten and sharpen the flavors." Sort the beans by spilling them onto a baking sheet and removing any debris and broken beans. Transfer the beans to a colander and rinse the beans with hot water until slightly whitened. Pour the beans into a large pot with a lid and add 2 quarts hot tap water. Bring to a boil over medium-high heat. Cover, decrease the heat to low, and simmer for 1 hour. Drain the beans by pouring into a colander in the sink; rinse with cold water. Return the beans to the pot. Add the ham hocks, onion, carrots, and 2 quarts hot tap water; bring to a boil. Decrease the heat to simmer, cover, and cook for 3 hours. Remove the ham hocks and set aside to cool. Allow the soup to continue to simmer. Remove the meat from the ham hocks. Dice the meat and return to the soup, discarding the gristle and bones. Add the savory or thyme. Season with salt and pepper. Simmer the soup for 30 minutes longer, then serve. 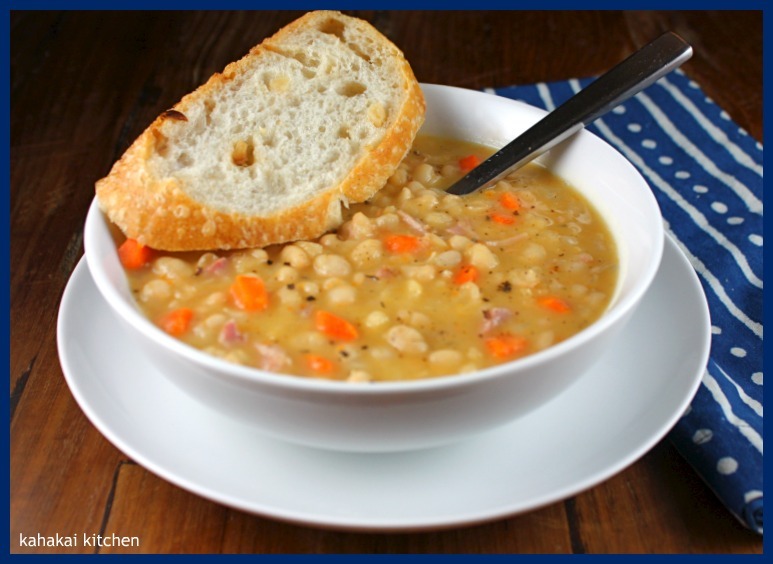 Notes/Results: Creamy, comforting, full of good flavor and just right for a rainy, windy day. This soup doesn't take a lot of effort, just some time and is good for a day when you can let it simmer away, filling the house with a delicious aroma that makes it hard to wait. I actually tested my soup and cut about 1/2 hour off of the cooking time. My beans were tender and creamy but not mushy, which is the way I like them. I replaced the ham hocks with a smoked turkey leg from my freezer. If you want to make it vegetarian omit the smoked meat and add a touch of liquid smoke or stir in some smoked paprika at the end. I liked the squeeze of lemon that Mather recommends at the end--it does brighten the flavors. A tasty soup that I would make again. 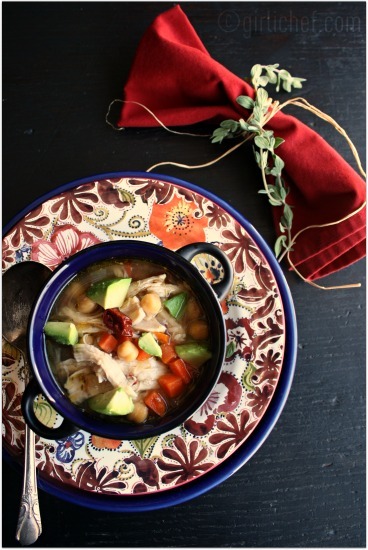 Heather of girlichef is protective of her Sundays and made this Caldo Tlalpeño Garbanzo-Vegetable Soup w/ Smoky Broth to comfort. She says, "So, you can imagine my chagrin when I found out that my husband's "holiday party" for work was on a Sunday night. From 5:00-8:00. In the evening. On a Sunday. What in the higgity-hizeck is that all about!? Can you imagine what's going on in my head for the entire weekend? I know, I know...chill out, right? Deep breaths. You will get through this. So a comforting bowl of soup with a warm, smoky broth, tender shreds of chicken, and earthy, mealy chickpeas with a hint of lime and some creamy avocado...well, it was just the thing I needed to guide me through this weekend. It soothed the obsessive, organized, control-freak side of me for the rest of the day. Isn't it amazing what a good bowl of soup can do?" It's nice to have fellow Hawaii blogger Spencer of Live2EatEat2Live Blog back this week. He made a flavorful Fish Head Soup and says, "Went to the Japanese warehouse market to look for vegetables. Found cut-up fish heads, fairly inexpensive. Decided to try to make fish head soup. ... Made a dashi with a small amount of dried wakame seaweed and dried shiitake mushrooms.Boiled firm tofu to squeeze the water out.Added ginger, Shao Xing wine and reconstituted wood-ear fungus to the dashi. 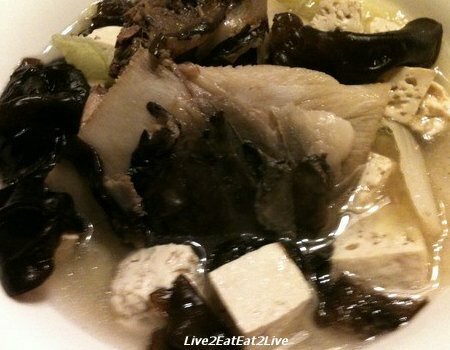 Added the fish head (this was part of an Aku or tuna head) and tofu, simmered for fifteen minutes, added the Napa cabbage and simmered for another fifteen minutes, done." 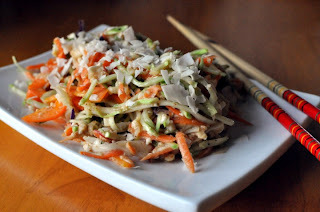 Janet from The Taste Space has a salad to share, this Coleslaw with a Spicy Almond Dressing (aka Raw “Pad Thai”). She says, "Here, you chop, grate, julienne and otherwise manually spiralize a host of veggies. Pick your favourites but some are more sturdy than others: carrot, cabbage, broccoli, cauliflower, bell pepper, etc. Then you coat them in a spicy-sweet almond sauce: ginger and chili flakes give you some heat, dates and agave confer sweetness, balanced by the sour lemon juice and saltiness from soy sauce. And of course, this all lusciously bathes within creamy almond butter. Add enough water to make a dressing and throw it on your salad. A spicy coleslaw. I didn’t want to mislead you by calling this pad thai. ;) Devour." Thanks to Heather, Spencer and Janet for joining in this week. If you have a soup, salad, or sandwich to share, just click on the Souper Sundays logo with all of the details. 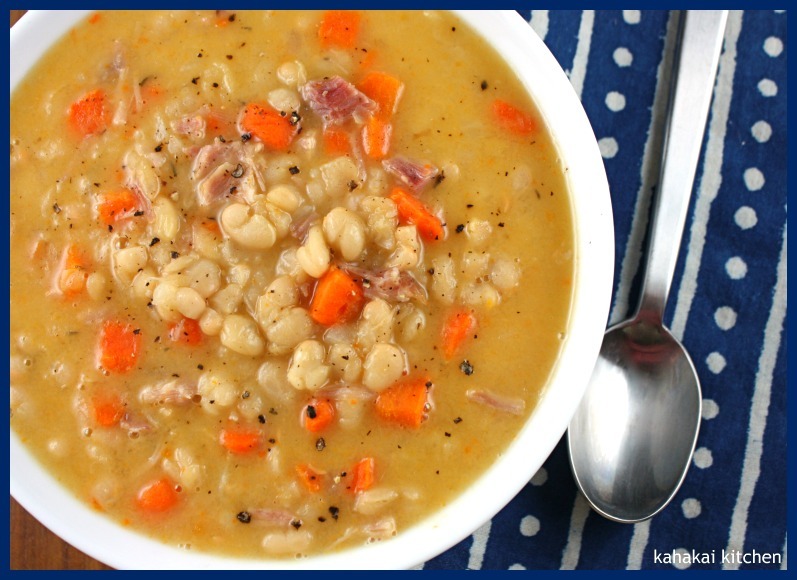 The Navy Bean Soup looks hearty. I've never come across navy beans here. But this is a great looking soup and I'm sure I could substitute. I'd love you to join in with Cookbook Sundays when you can. That navy bean soup sounds gorgeous! I am impressed - I would never have bought a book with such a turgid title! I really need to get back to reading before bed. It's such a great habit to get into! What a great comfort food soup! Your house must have smelled so lovely while that soup was cooking. Yum! All of those soups and the veggie "pad thai" sound good to me, my husband would love that fish head soup. 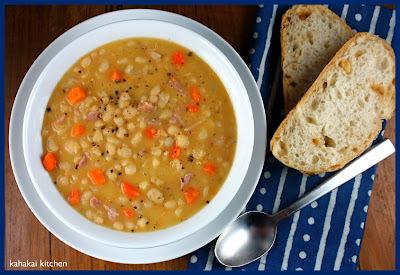 :) The navy bean soup sounds fantastic with smoked turkey and a squeeze of lemon at the end. Yum. Would be perfect for a rainy, cold day like today - we are having the same type of weather as you are right now (Texas). The Feast Nearby sounds like a good read. 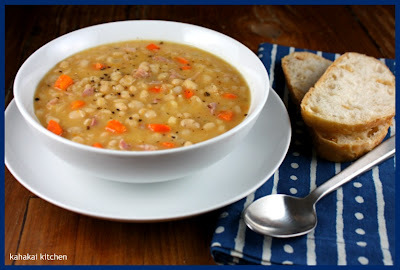 I love soup recipes that call for hours of simmering, especially when it is infused with smoked ham hocks. This navy bean soup looks so comforting.